Ferrari driver Sebastian Vettel of Germany celebrates winning the Formula One Australian Grand Prix in Melbourne yesterday. It was the inaugural race of the new season. Believing his Ferrari still lacks the race pace to fully challenge Mercedes in Formula One, Sebastian Vettel will take a little luck when he can get it. Yesterday at the season-opening Australian Grand Prix, his Ferrari team benefitted not only from a smart pit-stop strategy, but also the fortuitous emergence of a safety car midway through the race that helped Vettel take the lead from rival Lewis Hamilton and hold on for victory. "We got a bit lucky, but we'll take it," Vettel said. "We're not yet there where we want to be. But I think it gives us a good start, a good wind and fresh motivation for the coming weeks." It was the 48th race win of Vettel's career and his 100th podium finish, coming in his 200th F1 race. The German becomes the fourth driver to claim 100 podium finishes, joining Hamilton, Michael Schumacher and Alain Prost. 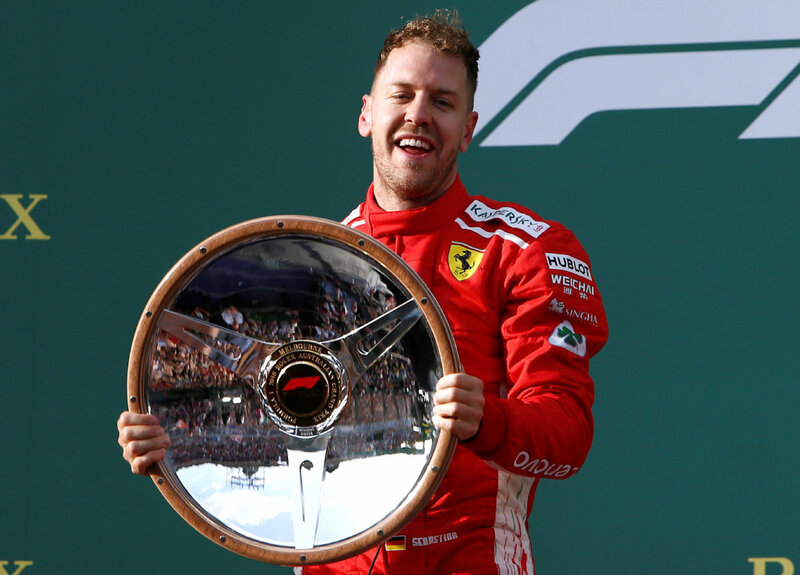 Vettel finished the race a full 5 seconds ahead of Hamilton, who started from pole and had made several late attempts to catch the Ferrari but couldn't manage to pass on Melbourne's narrow Albert Park circuit. Ferrari's Kimi Raikkonen finished third, denying Red Bull's Daniel Ricciardo a chance to become the first Australian driver to secure a podium place at the Australian GP. A resurgent Fernando Alonso of McLaren made a bold run to finish in fifth place, holding off a spirited challenge by Red Bull's Max Verstappen, who recovered after losing control of his car and doing a 360-degree spin early in the race to take sixth. Hamilton looked comfortable up front for the first 20 laps before deciding to pit, giving up the lead to Vettel. The race then took a dramatic turn when Haas drivers Kevin Magnussen and Romain Grosjean suffered calamitous back-to-back pit stops midway through the race. Both had been running strongly in fourth and fifth places, respectively, but were forced to stop immediately after coming out of pit lane with loose wheels. The virtual safety car emerged as race marshals removed Grosjean's car from the circuit and Vettel took advantage of the slowdown to pit and change tires. He came out of the pit lane just ahead of a confused Hamilton, who got on the radio to ask his team what had just happened. "Why did you not tell me Vettel was in the pits?" the Briton asked. "We thought we were safe, but there's obviously something wrong," his team responded. When racing resumed, Hamilton stayed close to Vettel's Ferrari, trailing by less than a second for more than 10 laps, but was unable to find space on the tight circuit to pass the German. With victory looking out of reach, Hamilton then eased up toward the end to conserve his engine for future races. Hamilton said after the race that he still wasn't clear exactly what happened. "I think just disbelief was really from that moment until the end. Just disbelief," he said. "I had extra tools and could have been further ahead by the first pit stop. There were so many good things we could have done." Vettel's victory comes a day after Hamilton set a blistering track record to capture pole position nearly 0.7 of a second ahead of the rest of the field, a massive margin that raised concerns among some teams that Mercedes had the speed to dominate yet another Formula One season. But Vettel said he believed Ferrari would fare better in race conditions — and he was right. "I think we didn't have the true race pace to match them but we weren't that far off," he said. "Even though we were probably lucky with the virtual safety car, we still had enough pace to stay ahead and make it very difficult for him to be close and try and do something." Ricciardo also pushed Raikkonen hard for the entire second half of the race for a chance at a podium spot, but the Ferrari driver put in a masterful drive to maintain third. "I think we're pretty close with Ferrari and our race pace is strong," Ricciardo said. "Being so close to the podium and getting fastest lap is definitely an encouraging way to start the season." Alonso also put several dispiriting years of technical failures with McLaren's Honda-made engines behind him, securing his best race result since late 2016 with the team's new Renault engines. Renault's Nico Hulkenberg finished in seventh place, just ahead of the other Mercedes driver, Valtteri Bottas, who crashed in qualifying and ended up starting in 15th place on the grid after incurring a penalty for switching out his damaged gearbox. McLaren's Stoffel Vandoorne finished in 9th place, followed by Renault's Carlos Sainz in 10th. Sebastian Vettel won a thrilling duel with world champion Lewis Hamilton to steal the season-opening Australian Formula One Grand Prix in Melbourne on Sunday.